Advocates fear the proposal signals that the Bureau of Land Management is abandoning fertility control being tested on Onaqui wild horses. (Rick Egan | Tribune file photo) Horses from the Onaqui wild horse herd, about 40 miles southwest of Salt Lake City, near Simpson Springs, seen in June 5, 2014. The Bureau of Land Management is developing a plan to remove 325 horses from Utah's most photographed herd. Utah’s most visible wild horse herd may get a lot smaller next year. 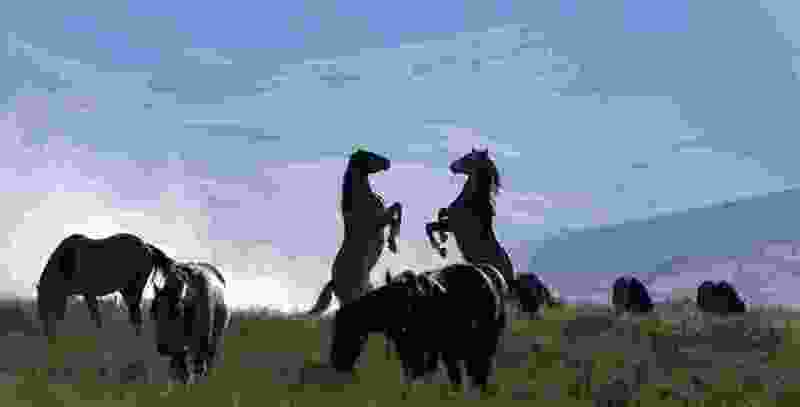 The Bureau of Land Management is proposing to remove up to three-fourths of the 450 horses that populate the Onaqui herd about 40 miles southwest of Salt Lake City. The move is needed to reduce effects the herd is having on vital sage grouse habitat occupied by Utah’s most imperiled population of the famous ground-nesting bird, the BLM said in announcing a public comment period through Oct. 31. The proposed roundup, known as a gather, would be conducted in coordination with Brigham Young University researchers studying the interplay between horses, sage grouse and vegetation treatments. Collected horses would either be put up for adoption or to live out their days in contract pastures. But the proposal has dismayed horse advocates who two years ago were singing the BLM’s praises for administering fertility control to Onaqui mares without roundups, which are costly for taxpayers and traumatizing for the animals. Advocates have long endorsed the use of a fertility vaccine known as PZP as a humane alternative for addressing horse overpopulation and hoped the Onaqui project would serve as a showcase for the drug’s effectiveness. A 2013 National Academy of Sciences report urged wider use of PZP for controlling herd sizes, which can double every four or five years. But in the years since, the BLM has slowed applications of the drug, which is typically injected into mares that have been rounded up in helicopter operations. “Instead of spending hundreds of thousands of tax dollars on another cruel roundup and putting more horses in holding, it should focus resources on vaccinating a sufficient number of horses with the PZP vaccine and giving this scientifically proven method a chance to work in a humane and cost-effective manner to stabilize this very popular herd,” Bolbol said. Two years ago, BLM officials began administering one-year version of PZP to ungathered Onaqui mares with the use of dart guns, made possible because these animals are acclimated to the presence of people who come to watch and photograph them. The agency partners with a Utah volunteer, Jim Schnepel, to administer the drug but not enough mares were treated to stem the herd’s growth, according to Reid. In the past year, Schnepel delivered the drug to 53 horses, or about 25 percent of the herd’s mares. A newcomer to the wild horse program, Schnepel had to be accompanied on his darting forays by a BLM staffer, who documented his work to ensure it was done correctly. Due to staffing issues, the requirement slowed Schnepel’s progress, but it was a necessary precaution that may get eased as he becomes more experienced and gains the agency’s trust, Schnepel said. “We will have bunch more autonomy this fall,” said Schnepel, who is also president of the Wild Horses of America Foundation. Though no fan of roundups, he said he sees a point for removing some Onaqui horses to balance the herd‘s needs with livestock and other wildlife. “Once the numbers are down that will enable us to actively control the numbers through this contraception,” he said. The program will continue whether or not BLM removes Onaqui horses, which would be available for adoption. Most removed horses go out to pasture, but Reid believes many Onaqui horses would find homes because their roan and sorrel coats are attractive and they are acclimated to people. While several PZP studies are underway on the West public rangelands, the Trump administration has dismissed fertility control as a viable option for controlling horse numbers. The new administration is urging Congress to allow the BLM to “euthanize” healthy horses and to sell horses for slaughter. Utah’s Rep. Chris Stewart has spearheaded legislation in support of lethal options, saying such measures are a more cost-effective way to humanely reduce horse numbers both on the range and in costly off-range pastures and corals. Such views received ample airing at a recent wild horse summit Utah officials hosted in Salt Lake City in August, where PZP was largely derided as a costly, inefficient way to tackle horse proliferation. Including gather costs, the BLM spends on average $2,600 to administer each dose of the drug, according to BLM Nevada state Director John Ruhs. A survey of summit attendees showed 99 percent favored commercial use of horses for pet food and 92 percent for human food, while only 63 percent supported increased use of PZP. The Onaquis inhabit one of 19 “herd management areas” the BLM manages in Utah. The agency says the proposed removal is designed to get that herd within its designated “appropriate management level” of 121 to 210 horses. To get there the BLM would remove 325, but the agency has not decided whether to round them up all at once or over a few years. The horses roam a 500,000-acre area surrounding the Onaqui and Simpson mountains. Elevating the need for horse removal is the loss of habitat to fire, according to Reid. In the last five years, 66,000 acres have burned including 38,000 this year. The BLM has initiated an environmental assessment that is now under public scoping. Comments can be e-mailed to blm_ut_cedarmt_onaqui@blm.gov.